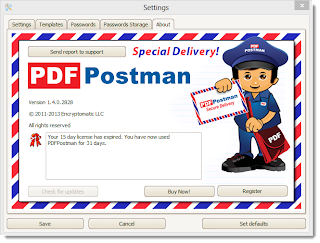 PDF Postman is the add-on for Microsoft Outlook 2013/2010/2007/2003 that secures your email message using the PDF frmat. It's an alternative to traditional email encryption software schemes intended to simplify the sending of sensitive messages and files for the recipient. PDF Postman is a good solution where the sender needs to deliver documents or a message by email, but does not need to receive a reply from the recipient. PDF Postman leverages the Advanced Encryption Standard (AES) encryption that is part of the PDF format. It supports encryption strengths of 256 bits or 128 bits. Since compliant PDF viewers are available across all platforms, from Windows, Linux, Mac, Android, iOS, Blackberry, etc., the recipient of a PDF Postman encrypted message need only know the password. The process for the recipient is simple. They click on the encrypted PDF file, and it opens in their local PDF viewer. 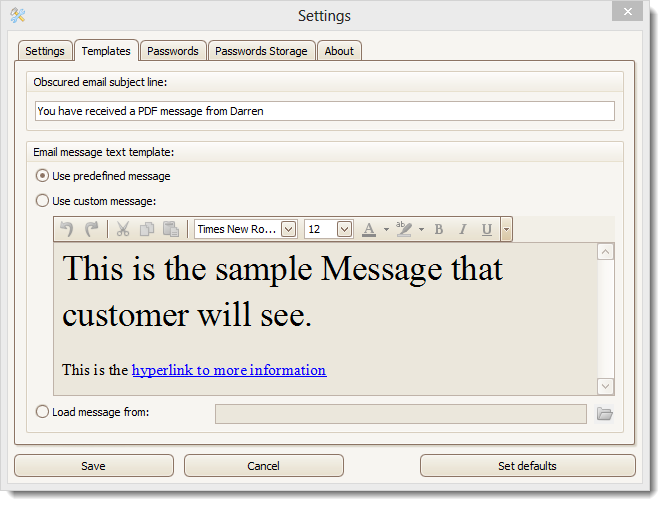 The recipient's PDF viewer detects the encryption and asks for a password. If the password is correct, the PDF message and file attachments are displayed. If the password is correct, the message is displayed. The same password to encrypt the file is used to unencrypt it. This is called symmetric key encryption. The PDF specification allows for embedding of files inside of a PDF. Embedded files may be extracted and saved on the recipient's desktop. PDF Postman will embed email file attachments as individual files within the PDF, making it possible for the recipient to extract and even edit the file. Since the entire PDF file is encrypted, both the message in the pdf image and file attachments are protected. PDF Postman integrates with the Outlook toolbar. In the image below, PDF Postman is placed on the toolbar for a new email message in Outlook 2013. To encrypt a message and file attachments, select the button, "PDF Encrypt Email," and then send the message. When the email is sent, PDF Postman converts the message to PDF format, embeds the file attachments inside the PDF file, and then encrypts the PDF file using a password you supply. It's easy to adjust PDF Postman's settings to make it operate the way you need it to. From the Outlook toolbar, click the PDF Postman "Settings" button. This will open a window that will show you several tabs. The first tab is the Settings tab. From you you can set the encryption strength, choose the language that PDF Postman operates in, and make decisions about whether a message should include a time stamp, or if an unencrypted copy of the message should be stored locally for email compliance reasons. PDF Postman Settings. Set encryption strength. The Template tab lets you create the template message. This template is used when sending to the recipient. It's a standard message that replaces the original message. The encrypted PDF file is attached to the templated email. Setting the PDF Postman template message. 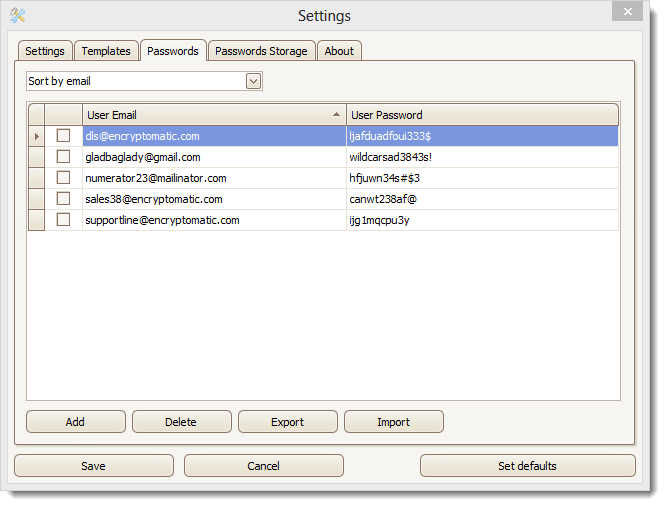 PDF Postman can also store your passwords for future use. When you send an encrypted email message, PDF Postman checks to see if a password is stored in its list for the recipient's email address. If a password is found, it is used. You can change the password any time from this list by clicking on it and typing a new one. PDF Postman includes an option to store passwords locally, or to share them on a central database with other PDF Postman installations. 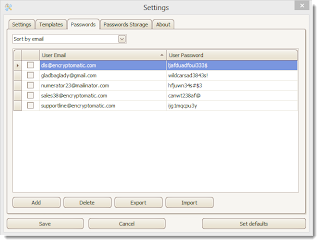 If you wish to use remote storage of passwords, your IT administrator can enter the address to your database in this field. 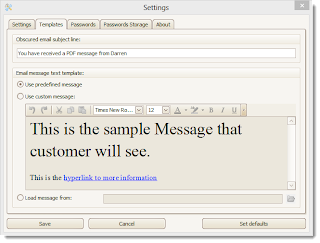 PDF Postman will then look for a password on the remote database prior to using a local password. This is useful when you have several people in your office interacting with customers, and you do not want to inconvenience customers with multiple passwords. PDF Postman supports remote password storage. To activate your PDF Postman software or to see which version you are running, go to the About tab. While we recognize that PDF Postman is not right for everyone, it's a very reasonable solution for many small offices. Users of PDF Postman include professionals such as attorneys, accountants, transcriptionists, translators, insurance sales people, bankers, local governments, and many others. If the goal is to deliver sensitive documents by email in a high trust environment, then PDF Postman may be a good business-practical alternative to using highly complex crypto-systems that are burdensome on the recipient. 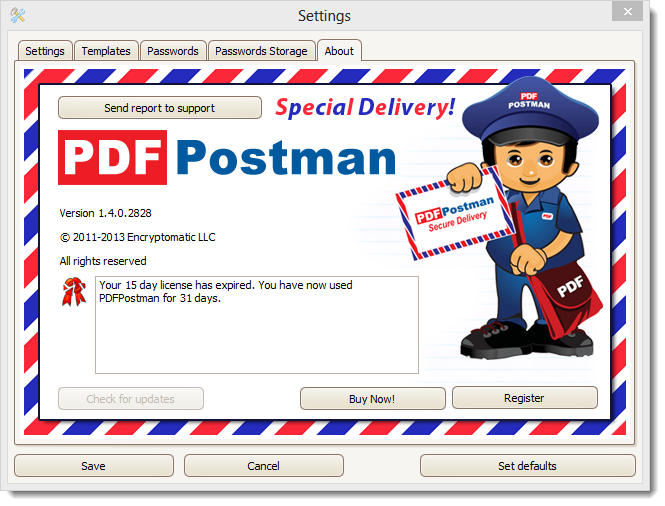 Download a free trial of PDF Postman and use it for 15 days.